UNITED NATIONS (AP) — President Donald Trump vowed Tuesday to “totally destroy North Korea” if the U.S. is forced to defend itself or its allies against the renegade nation’s nuclear weapons program, making his case in a combative debut speech to the U.N. that laid out a stark, good-vs-evil view of a globe riven by chaos and turmoil. “Rocket man is on a suicide mission for himself and his regime,” Trump said, mocking the North Korean leader even as he sketched out potentially cataclysmic consequences. The president himself decided to work the nickname into his speech just hours before he took the dais, according to aides. 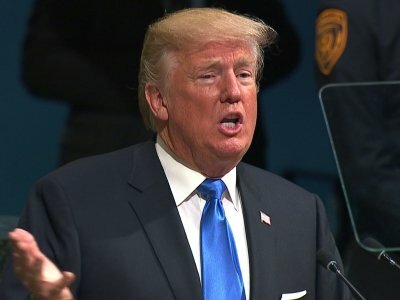 Trump’s overheated language was rare for a U.S. president at the rostrum of the United Nations, but the speech was textbook Trump, dividing the globe into friends and foes and taking unflinching aim at America’s enemies. North Korea’s ambassador and another top diplomat left the General Assembly chamber before he spoke to boycott his speech, leaving behind two empty chairs. The president urged nations to work together to stop Iran’s nuclear program and defeat “loser terrorists” who wage violence around the globe. He denounced “radical Islamic terrorism,” an inflammatory label he had shied away from in recent months after trumpeting it on the campaign trail. He called Syrian President Bashar Assad’s government a “criminal regime.” He said violence-plagued regions of the world “are going to hell.” He made little mention of Russia. But he focused more on the problems than the hopes. Trump, who has previously warned of “fire and fury” if Pyongyang does not back down, claimed that “no one has shown more contempt for other nations and for the well-being of their own people than the depraved regime in North Korea.” And he scolded that it was “an outrage” to enable and trade with North Korea, seeming to point a finger at China, although he did not mention it by name. Despite the speech’s bombast, it signaled little in the way of policy change. Trump stopped short of demanding regime change, which North Korea regards as the ultimate American intention and treats as a reason for its development of nuclear weapons. That may offer some reassurance to China and Russia, which have urged the U.S. to tone down its rhetoric and restart dialogue with North Korea. Trump, who frequently belittled the U.N. as a candidate, urged the world leaders to embrace their own “national sovereignty to do more to ensure the prosperity and security of their own countries. On Iran, Trump called the government a rogue state whose chief export is “violence, bloodshed and chaos.” He accused Tehran of squandering Iran’s wealth by supporting Syria’s Assad, Lebanon’s Hezbollah militia and Yemen’s Houthi rebel group. Trump called the U.N.-backed Iran nuclear deal “an embarrassment” to the United States and suggested it was one of the worst international pacts ever struck. And he hinted that his administration, which has accused Tehran of aiding terrorism in the Middle East, could soon declare Iran out of compliance with the deal, which could unravel it. The administration must decide in mid-October whether it will certify that Iran is still in compliance with the agreement. Domestically, reaction largely broke down along party lines: Democratic Sen. Dianne Feinstein of California said Trump used the U.N. “as a stage to threaten war.” Onetime Republican presidential nominee Mitt Romney tweeted that Trump “gave a strong and needed challenge” to the U.N.
Outside of an oblique reference to a threat to Ukraine’s sovereignty, Trump made no mention of Russia or its president, Vladimir Putin. He chastised the U.N. for what he said was a bloated budget and bureaucracy but did not reiterate previous threats to cut Washington’s commitment to the world body. Instead, pledged the United States would be “partners in your work” to make the organization a more effective force for world peace. Lemire reported from New York. Associated Press writers Matthew Pennington, Matthew Lee and Edith Lederer contributed to this report.